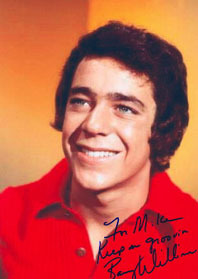 Barry Williams played Greg Brady, oldest boy in the squeaky-clean '70s sitcom The Brady Bunch and its several sequels. As an adult, he wrote Growing Up Brady, revealing that he went on a date with his TV mom Florence Henderson, got frisky with his TV sister Maureen McCormick, and that he was sometimes high on marijuana while episodes were filming. He grew up in Santa Monica, California, down the street and around the corner from actor Peter Graves. As a grade schooler, Williams began pestering Graves for show biz advice, and at 11 the youngster had an agent and began appearing in TV commercials. The Brady Bunch ran from 1969-74, and Williams also voiced Greg Brady on the cartoon The Brady Kids in 1972. He returned to the role for The Brady Bunch Hour in 1977, The Brady Girls Get Married in 1981, A Very Brady Christmas in 1988, and The Bradys in 1990. In addition, he has appeared on at least a dozen TV "specials" looking back on the Brady era. Between Brady reunions, Williams once said he found "solace in a bottle". Williams played the Biblical dreamer Jacob in the late-'70s miniseries Greatest Heroes of the Bible, but due to his close association with the role of Greg Brady, TV and film roles have been few and far between. He has appeared on stage in Victor/Victoria, Guys and Dolls, and The Music Man, among many other plays. He made his Broadway debut in 1988, in Romance Romance, and in 2004 he returned to the New York stage, filling in as Scrooge when David Cassidy backed out of The Christmas Carol. He also appeared in the video for Peter Gabriel's song "The Barry Williams Show". In 2001, Williams was fined $52,000 by Actors Equity for appearing in a touring non-union production of The Sound of Music. It was, according to Equity, the largest fine in the union's history. It was later reduced to $30,000, but Williams has complained to the National Labor Relations Board, and as yet the fine reportedly remains unpaid. The NLRB is investigating whether the Union interfered with Williams's right to work. In 2002, Williams was pummeled by The Partridge Family's Danny Bonaduce in a celebrity boxing match for Fox TV. He currently hosts a program on Sirius Satellite Radio's Totally '70s channel, and maintains a chatty website.